Crisp, salty skin; garlicky herb filling and incredibly moist meat: This is the best pork ever. Photo by Foodlovers | Fotolia. WHAT IT IS: Boned, stuffed, slow-roasted pork. WHY IT’S DIFFERENT: Using an artisan Italian technique, the entire pig is boned, stuffed, rolled and cooked for hours, resulting in a crackling-crisp skin and tender, moist meat. WHY WE LOVE IT: It’s the moistest, most flavorful pork we’ve ever had. WHERE TO BUY IT: Amazon.com and Costco.com. CAPSULE REPORT: Porchetta (por-KET-tah) is an entire pig that has been boned, stuffed and slowly roasted. The skin is very crisp, the garlicky stuffing is very flavorful* and the meat...ah, the meat! If you dream of great pork, it’s the stuff dreams are made of. After the first bite, you’ll be dreaming of it for the rest of your life. *A mixture of fennel seed, garlic, lemon zest, rosemary, sage and other seasonings. 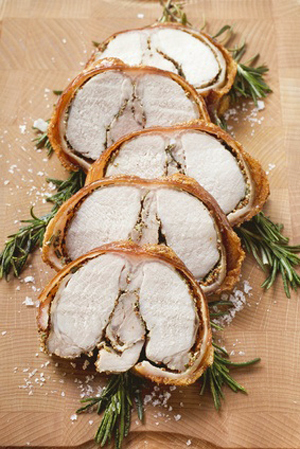 Italians have been enjoying porchetta for some time; mentions in Roman records date back to 400 B.C.E. It was frequently served at Roman banquets and was a favorite of Emperor Nero (37-68 C.E.). Today, the Italian Agricultural Ministry lists porchetta as a prodotto agroalimentare tradizionale, one of the nation’s culturally significant foods. Porchetta is pure pork paradise. The products from Porchetta Primata, a Kentucky-based company, are the best pork we’ve ever tasted. We discovered the company at a major food trade show. Among some 1,300 exhibitors and 80,000 products, it was the best thing we tasted. Even better, the porchetta arrives ready to heat and eat. It can be eaten at room temperature or cold, but the excellent fat tastes better warm. The meat needs no sauce, but serve it with roasted potatoes and seasonal greens. Broccoli rabe, spinach or Swiss chard, blanched and then sautéed with olive oil and garlic, are a great choice. Pour a nice Chianti, a Côtes du Rhône, Pinot Noir or a hearty ale. Read the rest of the review to see how we enjoyed our porchetta, plus more photos of the roasts and the entire pig! Start with the article index below. 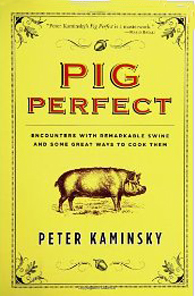 Pig Perfect: Encounters with Remarkable Swine and Some Great Ways to Cook Them, by Peter Kaminsky. All about pork production and consumption, plus recipes. Learn more. 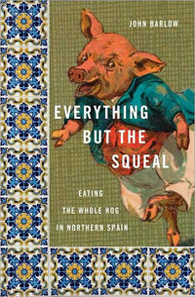 Everything but the Squeal: Eating the Whole Hog in Northern Spain, by John Barlow. A witty narrative about consuming every part of the pig, during a year-long excursion. Learn more. 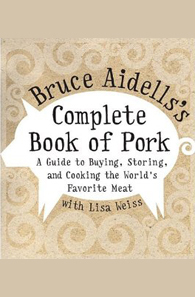 Bruce Aidells's Complete Book of Pork: A Guide to Buying, Storing, and Cooking the World's Favorite Meat, by Bruce Aidells. The famed California chef will make you a pork pro. Learn more. How many foods are flavored with bacon? Here are some affordable choices for bacon lovers. Rhubarb season is almost over. Grab those stalks and make a classic strawberry rhubarb pie—perfect for Father’s Day, served plain or à la mode.